No set up charge when decorating ribbon with text only. See Decoration Information for further details. 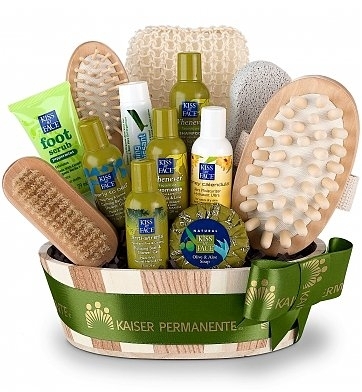 A spa basket to help de-stress & pamper hardworking employees and clients with this complete spa basket featuring an array of popular Kiss My Face natural products. Logo on ribbon available for additional charge. Measures 8.5" x 6" x 6" and weighs 2 lbs.